Paul is 19 and a talented musician and member of the Digital Orchestra – Scotland’s first orchestra for young people with disabilities. Paul attends weekly rehearsal sessions in our studio in Craigmillar where we have introduced him to a range of music software and apps which he accesses through an iPad. Over the past year, Paul has learned to produce his own dance music beats and loops (a section of music continually repeated which can stand alone or act as the foundation of a pop/ electronic dance track) and, as can be seen in this video, is creating performances for the Digital Orchestra. 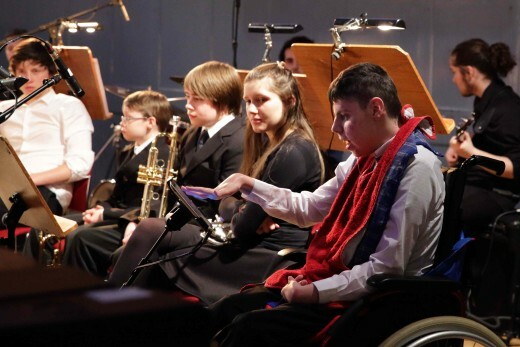 Being part of the orchestra has increased Paul’s own aspirations for himself and raised expectations of those around him – he now feels like a “musician” not a “disabled person” and that a career creating electronic music is open to him. His family see him differently too and is proud of his achievements. Ultimately, Paul is benefiting from being able to develop his skills in an activity he has a talent for and the opportunity to show others what he can do.